Oil on canvas by Trevor Waugh. 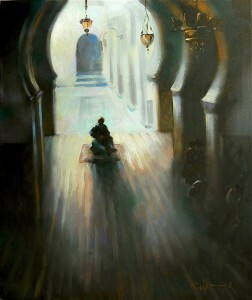 A definitive Oil painting with a central figure seated on a carpet in the light of an entrance. Inspired by a painting trip to Fez in Morocco. This painting has a magical quality because somehow the seated figure seems to be elevated, as if on a “magic-carpet’ . ” I saw this scene in actuality, although I had to paint my memory of it, it was a fleeting moment but has always stayed with me “.